Tiny variations in the isotopic composition of silver in meteorites and Earth rocks are helping scientists put together a timetable of how our planet was assembled beginning 4.568 billion years ago. The new study, published in the journal Science, indicates that water and other key volatiles may have been present in at least some of Earth's original building blocks, rather than acquired later from comets, as some scientists have suggested. Compared to the Solar System as a whole, Earth is depleted in volatile elements, such as hydrogen, carbon, and nitrogen, which likely never condensed on planets formed in the inner, hotter, part of the Solar System. Earth is also depleted in moderately volatile elements, such as silver. "A big question in the formation of the Earth is when this depletion occurred," says co-author Richard Carlson of the Carnegie Institution for Science's Department of Terrestrial Magnetism. "That's where silver isotopes can really help." Silver has two stable isotopes, one of which, silver-107 was produced in the early Solar System by the rapid radioactive decay of palladium-107. Palladium-107 is so unstable that virtually all of it decayed within the first 30 million years of the Solar System's history. Silver and palladium differ in their chemical properties. Silver is the more volatile of the two, whereas palladium is more likely to bond with iron. These differences allowed the Carnegie researchers, which included Carlson lead author Maria Schönbächler (a former Carnegie Institution postdoctoral scientist now at the University of Manchester) Erik Hauri, Mary Horan, and Tim Mock to use the isotopic ratios in primitive meteorites and rocks from Earth's mantle to determine the history of Earth's volatiles relative to the formation of Earth's iron core. Other evidence, specifically from hafnium and tungsten isotopes, indicates that the core formed between 30 to 100 million years after the origin of the Solar System. "We found that the silver isotope ratios in mantle rocks from the Earth exactly matched those in primitive meteorites," says Carlson. "But these meteorites have compositions that are very volatile-rich, unlike the Earth, which is volatile-depleted." The silver isotopes also presented another riddle, suggesting that the Earth's core formed about 5-10 million years after the origin of the Solar System, much earlier than the date from the hafnium-tungsten results. The group concludes that these contradictory observations can be reconciled if Earth first accreted volatile-depleted material until it reached about 85% of its final mass and then accreted volatile-rich material in the late stages of its formation, about 26 million years after the Solar System's origin. The addition of volatile-rich material could have occurred in a single event, perhaps the giant collision between the proto-Earth and a Mars-sized object thought to have ejected enough material into Earth orbit to form the Moon. The results of the study support a 30-year old model of planetary growth called "heterogeneous accretion," which proposes that the Earth's building blocks changed in composition as the planet accreted. Carlson adds that it would have taken just a small amount of volatile-rich material similar to primitive meteorites added during the late stages of Earth's accretion to account for all the volatiles, including water, on the Earth today. just one of those things that makes our earth special, in that our planet formed in what we call the goldielocks zone, but wich is not really a goldielocks zone (because close to protostar, blowing away volatile buildingblocks needed for life), until enriched with water from the outer solar system, hurled inside by the cosmic billiards of gas giants. On the other hand- perhaps earth is "volatile depleted" as the result of outgassing as temp/pressure increased as accretion progressed. That is the reason why these elements/compounds are denoted "volatile" in the first place. 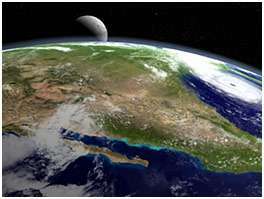 The Earth is a much larger, complexly-historied body than any comet, asteroid, or proto-planetary media. It is not at all surprising that its composition varies from that of its constiuent material. It seems silly that anyone would want to insinuate that it is composed of some kind of special material, that was somehow different than all the other material in the immediate neighborhood during formation. This article has a totally misleading heading - it screams about water being present at birth but then discusses details of depleted silver - without showing the vital connection between silver and water. Just because water is deemed to be volatile doesn't necessarily mean that it followed the same depletion path as silver. Maybe the authors should try making the connection clearer. 2 Peter 3 vs 5 says: "Long ago...the earth was formed out of water and through water". So you can flame me on this unscientific mythical statement all you want. Have fun! But just think a bit: Where did all the heavy elements come from in the first place? Shouldn't it first have been fused together from lighter hydrogen, helium and the like? And shouldn't there have been some formation of silver long before there was formation of palladium - all on the way of creation of the heavy elements? Something to think about. Any element heavier than Iron is formed simultaneously during a massive supernova or hypernova.